Not to mention a pile of manuals, disks, joysticks, etc etc. Why are these things still interesting in the day and age of 32 and 64bit computers? Because, even though they are simple, they are still very useful. Some businesses still run off them! People are still producing Operating Systems for them (Lunix, JOS, ACE, BOS) - unitasking and mulitasking, not to mention GUI based. There used to be a company (up until 2001) that would produce C64 after-market equipment, however they shutdown their C64 works and a C64 evangelist later picked all of their stock and store up, and is now making them non-profit. The C64 runs off a 6502 0.9mHz processor, utilising custom built graphics (VIC II) and audio (SID) microchips. 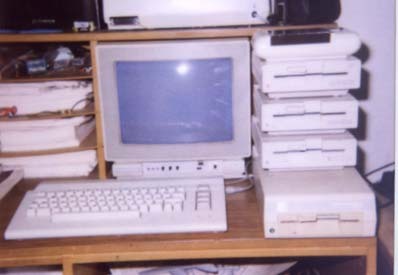 The C64 went through a couple of incarnations, from the original "breadbox" keyboard, to my C64-C keyboard style, into the C128 which was basically a C64 with 128k.